One of my favorite materials to use in hand stitching and crafting is felt. Felt is readily available at craft retailers but there are several types. I went out and purchased a selection to compare for you, crafty readers. The first and most beloved type is 100% wool. This felt is reported to have an almost mystical perfection but is really expensive and is only available online or at specialty outlets. I’m sorry to say that I did not purchase or test this felt. I can only go by the word on the street that says it is fantastic. Another type of felt that you can actually find at stores is also commonly called “wool felt” but is really a wool/rayon blend. American fabric retailer JoAnns has a selection of this felt manufactured by National Nonwovens at about $10/square yard. I’ll disclose right away that this is my favorite felt and I have a good sized stash of it in every color. JoAnns only carries a small selection, unfortunately, so I usually need to go online to get certain colorways. Most commonly available in craft stores is synthetic felt made from acrylic or polyester. JoAnns and WalMart both carry a nice synthetic by Kunin Group made from 100% recycled bottles. Priced at under $4/yard for a large 72-inch width, this felt is an excellent value. Squares of this Ecospun polyester felt are stacked in the craft area and are about 20 or 25 cents each. Finally, at Michaels and Hobby Lobby, I found 20 to 25 cent acrylic felt squares of unknown manufacturer. Hobby Lobby’s acrylic felt was the softest and fuzziest. Michaels’ was also soft, but thinner and more dense. Wool/Rayon felt has the most “natural” feel for obvious reasons. Acrylic is slightly scratchy. Actually all felt is slightly scratchy and if you are allergic to wool, I suppose you would be scratchiest of all using felt of that fiber. I noticed that the acrylic felt has a slightly glossy sheen to it. Many people prefer it for this very reason. In this photo, my wool felt is the darker dull cut leaf on the far left. One of my biggest problems with synthetic felt is that it is too translucent. I want my applique projects to stay true to their color and not have the backs of my threads and patterned fabrics showing through. Look how easy it is to see the paper behind this felt square from Hobby Lobby. I was surprised to find that the synthetic felt squares I saw at Michaels were reassuringly opaque just like my wool/rayon blended felt. Different colors of synthetic felt will have varying levels of translucency. I washed small felt squares and the felt all held up well in my regular laundry wash and dry cycles. Only the wool felt shrunk considerably and had marked change in its texture. The synthetic felts all came through the wash virtually the same as they went in although just a little bit fuzzier. All felt will pill and fuzz over time depending on how you use it. Note on this purse applique that the blue synthetic felt has pilled the most. The other colors are natural fibers. 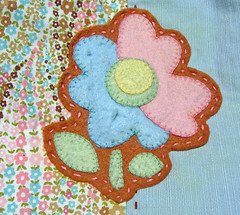 I use felt in little handstitched appliques and small felt mascot projects. Ease of cutting and stitching are important to me. I find that synthetic felt drags against my needle when I am stitching and resists my scissors when I cut. Friends of mine who hand stitch felt find that this does not bother them and they like the synthetic felt because of it’s availability. Synthetic felt is available all over the place. They might even have a stack of it at your local drug store. You can find 100% wool felt and wool/rayon blend felt online at A Child’s Dream Come True, Prairie Joint Junction, and Erica’s, as well as many other sources. After doing these tests, I still prefer stitching with my wool blend felt. I’ll save the synthetic for Brownie troop projects and things I expect to launder. Of course I love anything of any type of fiber that my crafty friends have made for me! What about you other users of felt? Are you lovers of synthetic or do you prefer natural wool? Excellent review Susie! I too adore natural felt. Also the colors are amazing when it is 100% wool! Yes it pills and turns into fuzzies – like all felt – but not as bad as the synthetic felt IMO. Also – have you seen the difference in the blends? Just an uplift of 5% will effect the softness and structure of the felt! Again I love your creations and wonderful review! By the way, the little stuffed animals at the bottom of the post are like the cutest things ever! I gotta work on my sewing skills. so dragging out my felt this week!! I wanted to sew a small piece of felt to a t-shirt I wanted to make for my boyfriend, but the lady at the craft store said that I couldn’t wash it normally, just dry-wash, or otherwise the felt would sort of “disintegrate” (sorry, I’m lacking a better word… my English is not so good!). But I guess from your post that if I do this with synthetic felt, nothing has to happen… right? Very, very thorough! Thanks for all the info. I will have to bookmark this entry. sfer- I’m not sure where this notion that felt disintegrates comes from , but it really does not. Maybe vintage felts that our grandma’s collected were less reliable, but these really do wash up great. You might want to prewash your felt and the shirt you will applique just to be sure. Also be sure it is securely appliqued at the edges. Expect the felt to pill over time! Sometimes the ladies at the craft store are super helpful, but sometimes they are misinformed! Scrappy rat- Thanks for adding your thoughts about wool and animal cruelty. Indeed, Ecospun is a great alternative at a really great price! Thanks a million for your feedback comment! Hi! I’m using synthetic felt and I want to know if there is a way I can make it thinner. I am trying a blend felt with over 50% wool. A lot of tiny fibres just come off when I cut with scissors. Is it normal and safe? The felt can really “disintegrate” if it is cut into very small piece or slender strip! What a review! I found this through a google search and it’s invaluable to crafters! hi! i’m lowell from the philippines. i’m a craft store owner and would like to introduce personalized appliqued shirts. what die cut machine would u recommend? i need a good machine that will cut felt and fbric perfectly. thanks!